As the name already suggest it, Kiss is an online video slot with a musical theme based on “KISS” – a popular Rock N Roll band from America. This game is a 5-reels slot with 100 paylines that was created by WMS software developer. You will encounter here the band members as symbols of this game. The higher value symbols are a guitar pick and Gene Simmons’ tongue. 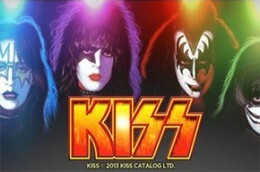 Kiss offers to its players scatter and wild symbols, multipliers, and a bonus free spins feature.